Tree of Jesse window in Most Holy Mother of God Catholic Church in Vladivostok, Russia. Bishop Klimovich oversees the Diocese of St. Joseph in Irkutsk, Russia. Geographically the largest diocese in the world, it includes much of eastern Siberia and all of the Russian Far East, including Vladivostok. Fr. Fessio is a well-known teacher and theologian, and the founder and editor of Ignatius Press. He visited Vladivostok, Russia, in July 1992 and introduced the priests to email communications. Fr. Illo serves as a priest for the Diocese of Stockton. Another longtime supporter of the mission, Fr. 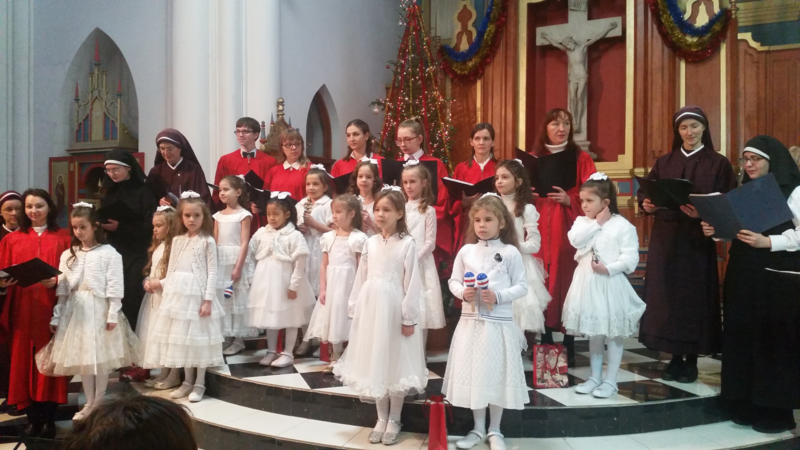 Illo has visited Vladivostok, Russia, and oversaw the development of a sister parish relationship between his former parish in Modesto and the Catholic parish in Second River, Russia. Fr. Stoeckig is the Vicar General for the Diocese of Las Vegas. He has been a friend of the mission for many years and hosted one of the mission society conferences at his parish. David and Sandra have been active in the mission society since 1992. For many years, David provided bookkeeping and operational assistance. He also served as the society’s board chairman for many years. Between 1999 and 2008, Sandra served as the society’s National Coordinator, overseeing all aspects of communication, newsletter production, marketing, donor development, and mission society growth in the United States. Terry and Debbie have been mission supporters for many years. Early on, they stepped forward and provided for the creation of the beautiful Annunciation window in our church in Vladivostok—the first window to be installed and dedicated. Terry, who is a regional marketing manager for EWTN, also served on our Executive Board for years, providing invaluable development, marketing, and business advice. Mary Jo is a retired teacher who became involved with the mission through the sister parish program. She is an avid traveler and visited the parish in Vladivostok in 2006. She now volunteers by speaking to various groups on behalf of the mission and by attending conferences as our representative. Fr. Myron is a native of Evansville, Indiana. He holds a B.A. in Mathematics and Physics and an M.S. for Teachers degree in Astronomy. He also had Theological training at Crosier House of Studies, and was ordained in 1972. Since then, he has served as a science educator, school administrator, vocations director, and junior seminary rector. In 1991, Fr. Myron accepted the invitation to become the pastor of Most Holy Mother of God Catholic Church in Vladivostok. Since then, he has opened or reopened 8 parishes in neighboring cities. Fr. Myron founded the Mary Mother of God Mission Society in 1992. 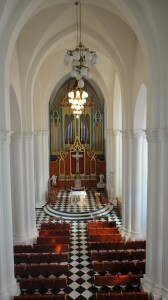 The interior of our Vladivostok church, as seen from the choir loft. Fr. West is a native Texan who currently pastors St. Edward Church in Texarkana, Arkansas. He has visited our parishes in the Russian Far East on 3 separate occasions. He was instrumental in developing strong sister parish relationships at his former parishes, Immaculate Conception, in North Little Rock, and St. John the Baptist, in Hot Springs, Arkansas. Fr. West also speaks on behalf of the mission and has appeared on radio talk shows, promoting the mission work. Fr. Daniel hails from western Michigan. He holds a B.A. in East Asian Studies and a Masters of Divinity degree. He also studied biblical theology and Church history at the Pontifical University of Santiago, Chile and at St. Patrick’s Seminary, Menlo Park, California. He accompanied Fr. Myron to Vladivostok, Russia, in February 1992 and was ordained later that year in Novosibirsk. Fr. Daniel has been featured on EWTN in an hour-long interview with Raymond Arroyo. He has also been interviewed on Catholic Answers Live, Ave Maria Radio, and EWTN Radio. Susan has been a volunteer with the mission since 1993 and began working part time in 2000. She has written a number of successful grant proposals to support mission activities and has visited Vladivostok 4 times, twice leading mission teams from her own parish. She has also written articles about the mission for various publications and websites. Fr. Bauer is a native of the Chicago area and has been a priest of the Archdiocese since 2004. He is currently the Associate Pastor at St. Luke’s Parish in River Forest. Previous assignments included a college campus and St. Joseph College Seminary in Chicago. In those roles, he served as the spiritual director for students on summer mission trips. It was a trip in 2011 that led him to the Russian Far East. Moved by the plight of the impoverished people and by the simple ways he could bring hope and joy, Fr. Bauer was inspired to return in 2013. Fr. Grandon lives in Denver, where he serves as National Chaplain for FOCUS (the Fellowship of Catholic University Students), as Parochial Vicar at St. Vincent de Paul parish and where he teaches Homiletics at St. John Vianney Seminary. He has been affiliated with the mission since 2004. Fr. Grandon can be reached at grandon@bradley.edu. Lynn is the wife of Fr. Douglas Grandon. She is the Director of the Respect Life Office for the Archdiocese of Denver and also the Executive Director of Lighthouse Women’s Center. Lynn has made a number of presentations to hospital and women’s center staff in Vladivostok on life issues. She has also assisted with various diocesan promotions of the mission. Tyler is the Manager of Technology Services for the Fellowship of Catholic University Students (FOCUS). He served for 8 years as FOCUS missionary, working at the U.S. Naval Academy and serving as a “missionary to the missionaries” in Denver. Dr. Moran is an associate professor in the Department of Sciences at Wentworth Institute of Technology in Boston. He serves the mission society by speaking and raising awareness through his affiliations with the Knights of Columbus and the Ancient Order of Hibernians. He has been instrumental in a number of fundraising efforts within these groups as well as with his own parish. Jeff is another long-time supporter of the mission. From his home in Oregon, he not only speaks locally on our behalf, but has also been a driving force in the development of a sister parish relationship. In addition, Jeff travels for the mission society, attending conferences and speaking at parishes throughout the region. In 2008 when she became National Coordinator, Vicky began to oversee the stateside mission operations. She has since seen the office space grow from a small home office to a large, spacious site that includes a religious goods retail store. Her husband, Craig, often volunteers in the mission office. Vicky and Craig have 3 grown sons. Her passions are the mission and her growing family, especially her 4 grandchildren. Jessica began as a volunteer for the mission in 2011. Today she works full-time and is an integral part of the USA mission office. Jessica coordinates conferences and parish mission talks, makes contacts for Fr. Myron’s and Fr. Dan’s US visits, and provides administrative support in all other areas. She is a graduate of San Francisco State University with a Bachelor of Science degree in Mechanical Engineering. She is also an outstanding pencil artist. 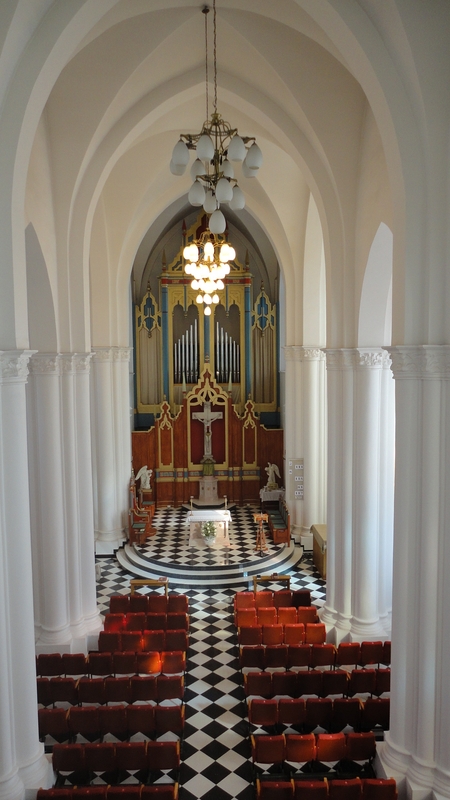 Jessica has visited the mission in Vladivostok as well as the seminary site in Maumere, Indonesia. She is married to Vicky’s son Mason and they are expecting their first child in August of 2018.